You can take a taxi (cost about 30euro), telling the driver to drive you to Aspa Villas at Oia. The distance of Aspa Villas from the airport is approximately 18km (20 minutes). You can also take the local bus (cost about 1.60€ per person, one way) which will drive you at Fira’s central bus station. It does not run on a regular basis and may only run every few hours (i.e. 7:30am, 11am, etc). The bus schedule is posted outside the airport and just before the exit. Then you can take the bus which runs to Oia village (runs every 45-60 min. cost 1.60€ about) and disembark at the bus station of Aspa Villas. (note: you must tell the driver that you intent to disembark at Aspa Villas). You can either take a taxi (cost 30€ about)or the local bus (cost 2€ about) which runs very frequently. The bus will drive you to Fira’s central bus station. Then you can take the bus which runs to Oia village (runs every 45-60 min. cost 1.60€) and disembark at the bus station of Aspa Villas. (note: you must tell the driver that you intent to disembark at Aspa Villas). The port is 20 km away from Aspa Villas. TIP: It is very handy to have a copy of the bus schedule (from http://www.ktel-santorini.gr) or write down all the departure times and keep it with you, so you know when the bus will come. You should follow the main road (either you are arriving at the airport/port) to Fira, the Capital of Santorini. 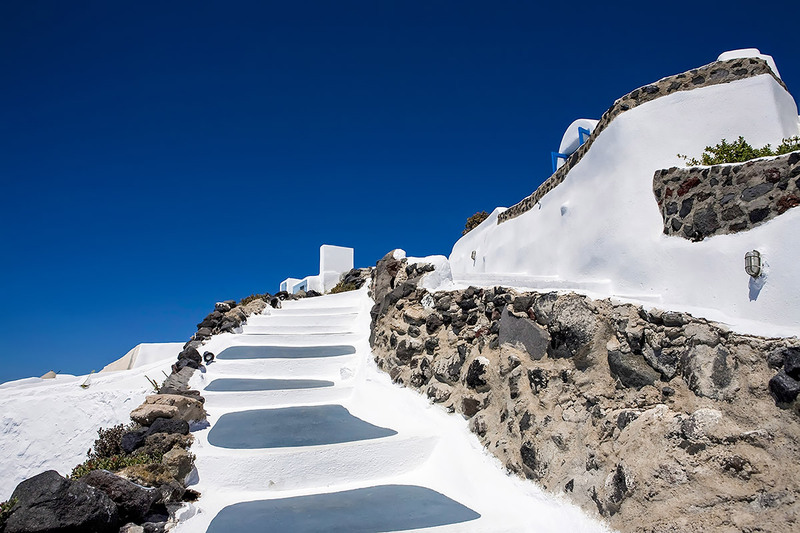 When you reach Fira and particularly the central square you will follow the main road towards Oia. The nearest public parking is on the main road 20 meters far from Oia’s first mini market and 5 meters far from Vazeos Santorini Rent a Car. Aspa Villas’s reception is just across.